I don’t remember when the conversations began, probably in the mid-sixties. We would count the years forward by fours trying to figure out the first possible games we could qualify for–and in what event. The sprints were our ultimate glory prize, but early on we said we’d settle for a spot in any Track and Field event. We organized neighborhood Olympics, jumping over fences for the high jump and heaving stones around for the shot. A lamppost-to-lamppost run was our 100-Meter Dash and all the distance events were wrapped into a ’round the block run that was probably no further than a 1000 meters but felt as dramatic and painful to us as Abebe Bikila‘s barefoot marathon. My earliest Olympic memories were built around revered legends from the 1960 Games in Athens I’d never seen: Marathon champion Bikila and Gold medal decathlete Rafer Johnson. 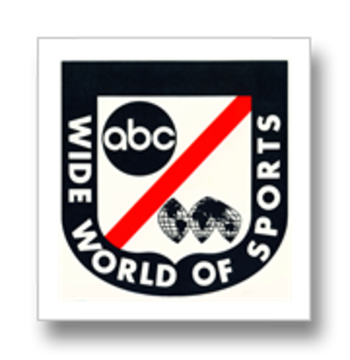 We’d learned their stories watching recap footage on ABC’s Wide World of Sports. I especially remember a program in which Johnson and ’68 Decathlon Champion Bill Toomey did a demonstration competition together. I don’t remember if they declared a winner, but the image of a white man and a black man competing against one another in an atmosphere of deep, mutual respect burned a lasting impression on my moral imagination. Watching that show was a church service on a Saturday afternoon for us, the swelling theme music more spiritually evocative than ranks of organ pipes and Jim McKay‘s voiceover as stirring as any sermon: “Spanning the globe to bring you the human drama of athletic competition: the thrill of victory–and the agony of defeat.” We never tired of watching that spectacular soccer goal scored and never failed to shudder when the ski-jumper fell coming down the ramp, spiraling into an absolutely brutal wipeout. We couldn’t have said so at the time, but I think it was that human drama, or more precisely the humanizing character these dramas revealed, that impressed my brother and me more than the victories– or the defeats– we watched. Bikila had reclaimed his race for himself by chucking the shoes of his corporate sponsor. His suffering had that much more dignity and meaning because of his integrity. 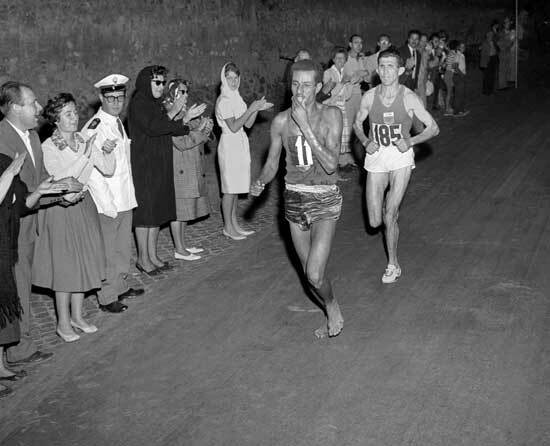 When reporters asked him why he had run barefoot, he is reported to have replied: “I wanted the world to know that my country, Ethiopia, has always won with determination and heroism.” In Tokyo in ’64, Bikila was still recovering from appendicitis and wasn’t supposed to compete. The 70,000 gathered to watch the finish erupted in shock and jubilation when he entered the stadium alone in world-record time, but Bikila jogged right through the tape, hit the ground and immediately started a calisthenics routine. “I could have run another 10K,” he said later. The image of the great champion doing those exercises was shown often on “Wide World.” It’s still a visual reference my brother can site without saying a word by jogging along and suddenly hitting the deck for sit-ups. 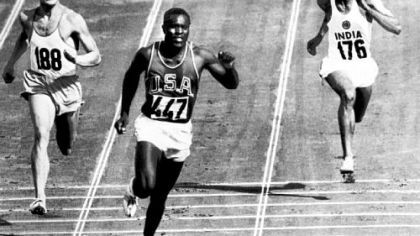 Commentators agree that Bakila would likely have won the ’68 Marathon in Mexico City if he hadn’t had to drop from the race due to a broken bone in his foot suffered days earlier. I realize now that much of this romantic messaging was a part of the way sports were sold in that era, but considering the messages so often attached to today’s sports celebrity marketing plans, I refuse to be cynical about an era in which noble ideals of character and integrity were built into the symbols of athletic mastery as a matter of custom. By ’68 we were watching the Mexico City Games live. 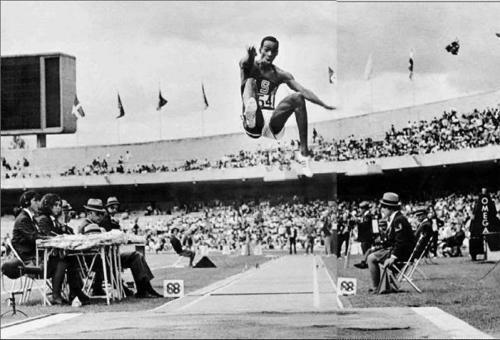 Bob Beamon‘s miracle long-jump re-ignited our childhood obsession with the games. We kept Beamon’s story alive for four years, jumping over driveways in training, waiting for the next Olympics. When Munich arrived under the gloom of the Israeli murders, we felt like we were on the edge of our own athletic careers, resigned to the truth that despite great neighborhood-caliber speed our best chances for the games lay in the distance events rather than the sprints. 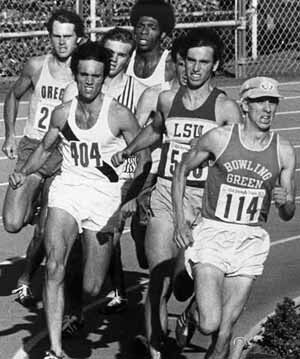 And so it was with utter shock and disbelief that we watched Prefontaine passed in the final stretch of the 5k and Jim Ryan fall to the track, tripped up in his bid to beat Kip Keino in the 1500. 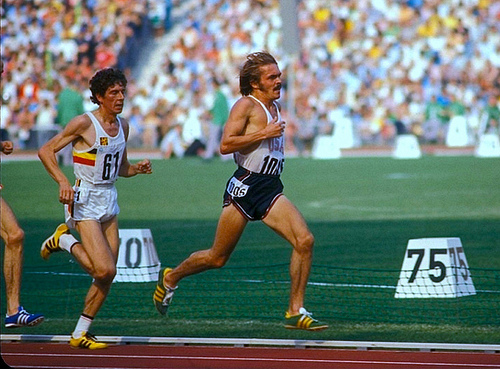 But we nearly jumped through the ceiling for pure joy when Dave Wottle–an unknown guy in a golf hat who seemed to be left in the dust as the gun went off in the 800–came from the back of the pack to lean for gold. We were in high school during the Montreal games when American boxing grabbed the spotlight with the Spinks bothers and Sugar Ray Leonard. We were almost men. Suddenly, there were people our age aiming for the games in some events. Since Track was still king for us, Bruce Jenner‘s quest for gold in the decathlon was in the center ring. But our fascination with that event wasn’t the product of the celebrity machine already cranking up in the mid-seventies. 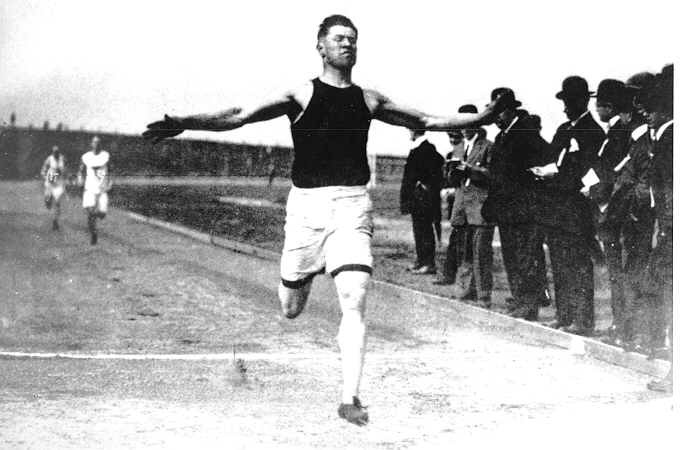 Long before we saw Jenner on a Wheaties box, we loved the decathlon because it had been won by the one man who could claim the all-time title of the World’s Greatest Athlete: Jim Thorpe. And all of that without even talking about being an All-American in Football and taking his tiny school to a National Championship, or reaching the Pro’s in baseball. And then there was the underlying, most basic lesson: talent aside, the courage, heart and effort he had to have expended on the track and in the field to have delivered on all of that talent. 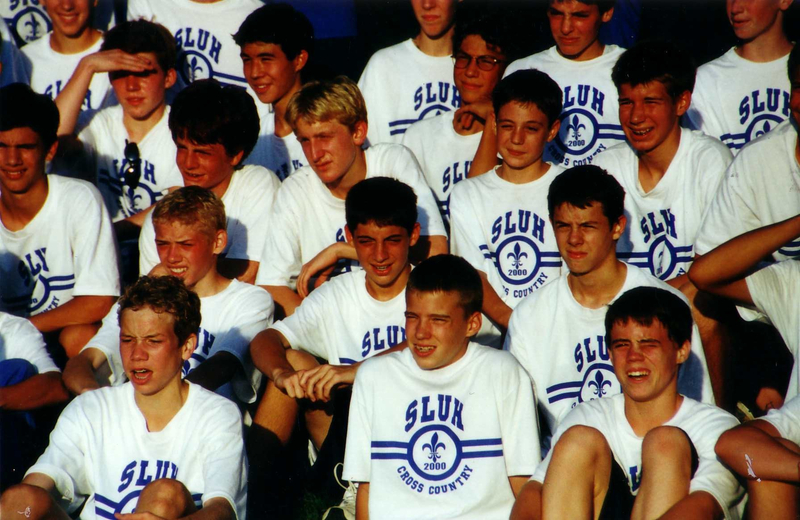 When I had the opportunity to coach some great high school champions years later, I came to see very clearly what I’d only felt intuitively as a kid: winning wasn’t just a matter of genetics; it was the product of intense, single-minded desire, a willingness to risk and the decision to endure. 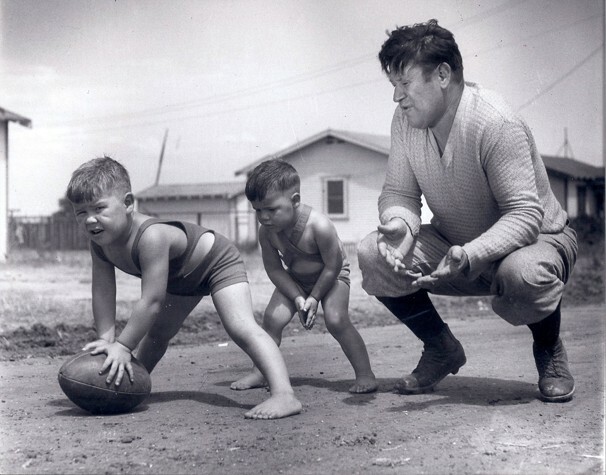 For these fundamental virtues, Jim Thorpe was, for us, the undisputed patron saint. The Moscow Games in ’80 were boycotted by the U.S. and I still recall the shock. I was 22; these were, at last, our games. Never mind we hadn’t gone to the trials. The point was we could have! A friend in College had made the U.S. Soccer Team. Instead of a trip he got the uniform he would have worn to the opening ceremony. World politics had killed the Olympics. Civilization was coming to an end. The center couldn’t possibly hold. 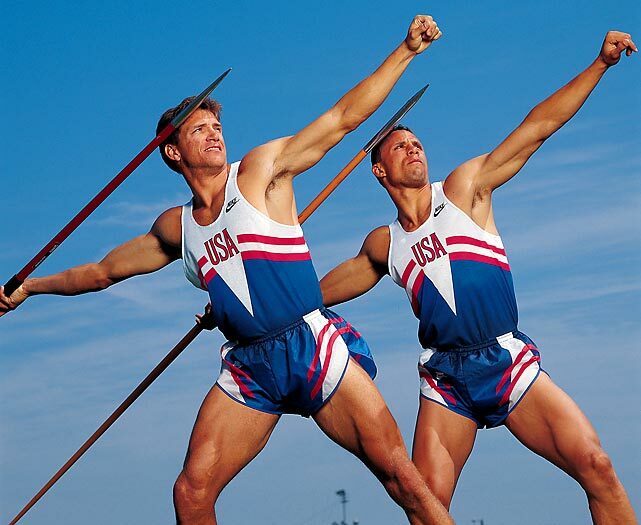 By the ’84 Games in Los Angeles our dreams of actually being Olympians were over. I was already married and my brother and I both had jobs. The ritual of picking an event became a way to enjoy who we were as kids and to poke ourselves out of complacency about staying fit enough for whatever a 30, 40 or 50 year-old ought to be able to do with his body. But as the years passed our passion for the Games remained. When the super-rivalry between Dan O’Brien and Dave Johnson was being hyped by Reebok, NBC and just about everyone else in advance of the ’92 Barcelona games we were all in. Besides, O’Brien looked just like another one of my younger brothers–the best all around athlete our family had produced. He couldn’t lose. But he did lose. In fact, he didn’t even get a chance to compete. 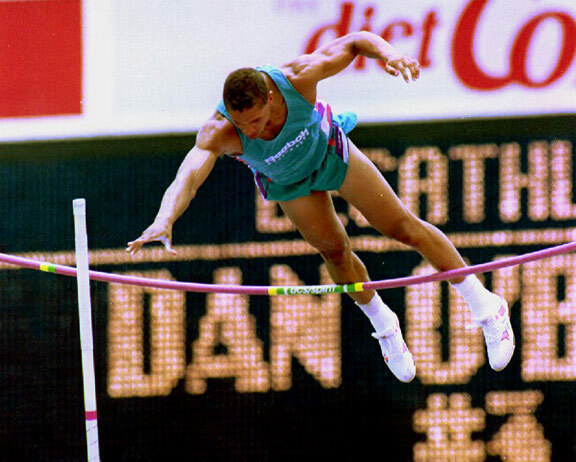 At the trials, he passed on the early rounds and no-heighted in the Pole Vault, his best event. We were adults with our own kids by ’92 but the feelings of bitter disappointment and shattered dreams might as well have sprung from a 12-year old psyche. O’Brien’s shocking failure recalled the excruciating image of Jim Ryan lying on the track in ’76. Only this was much worse. Ryan’s triumph hadn’t been prepackaged and sold before he stepped on the track. And he hadn’t tripped himself. In 2007 I had the opportunity to meet Dan O’Brien. 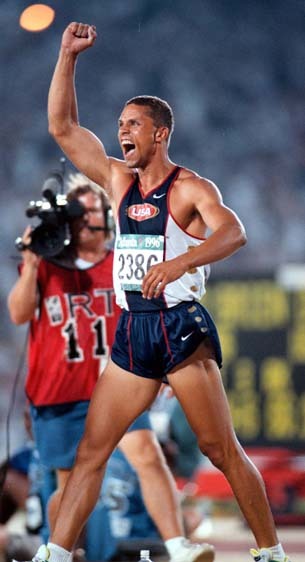 He had, of course, triumphed in the ’96 Atlanta Games, at last capturing the Gold Medal the celebrity-marketing world had all but handed him in ’92. He was a presenter at a coaching workshop I was attending. He still looked like my other younger brother and I found I was still very focussed–as were most of the folks at the conference–on the fiasco of ’92. But no one was asking about it in the Q and A. I decided to risk it. For a second I could see the frustration and exasperation coming through. Part of it was certainly the question, but I thought I could also read signs of the original wound. But he immediately brightened. I could tell he had something important to say. That phrase captures so much territory for me now: spiritual lessons I wasn’t ready for at 30, or even at 40. And it had an almost immediate impact on my own coaching. 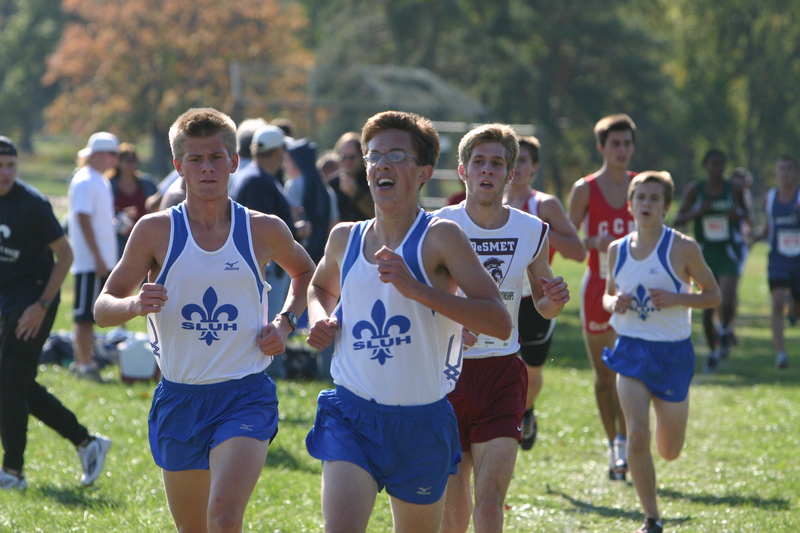 We’d had great Cross Country teams for years at my school. But we’d only won one State Championship in a year we’d been heavy favorites– and that by only a single point–a margin much closer that a buzzer-beater in Basketball. 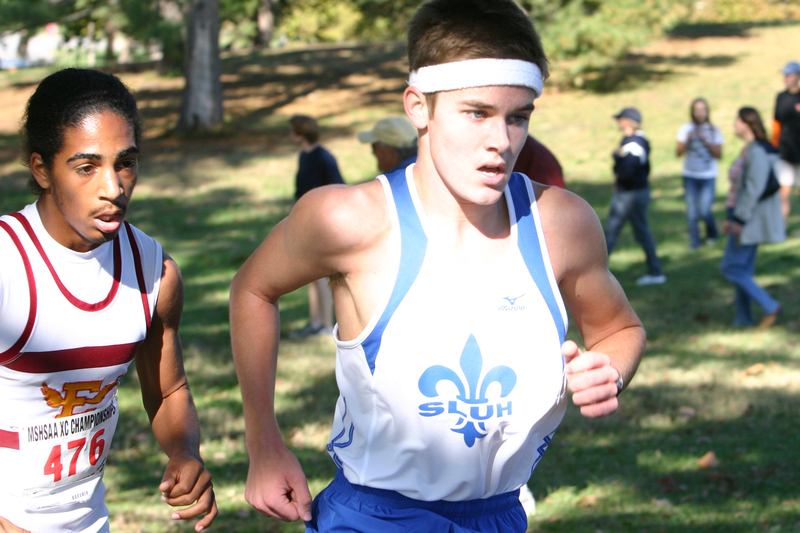 It was my incredible good fortune to have teams that really did “love the process.” Most of them loved to run. And those that didn’t loved being together. In the next five years we won two State Titles and were second twice. It certainly helped that we had spectacular talent and a line of great champions in those years. They were young men even more impressive for their virtues of generosity and hard work than for their many medals. When the gun went off, they were champions full of courage like Thorpe, risking giving everything they had to capture the prize. But they also modeled for me this other great truth, one that better sustains the vast majority of us who will never be champions. One that serves all of us in facing, with peace and even joy, the inevitability of loss. One that is coming in handier and handier for a runner in his mid-50’s. So my brother and I won’t be buying any guns to make a last-ditch effort to qualify in some obscure event for the London games in a few weeks, though we’ll still pick some event to shoot for in the next Olympics. But we both still love the games and can’t wait to see what Rupp will do in the 5K.